Shulton has always been a master at marketing its products. Through packaging, products were combined to create gift sets or were sold in some form of useful or decorative packaging. Accompanying these product releases were creative and memorable ad campaigns - especially prolific magazine ads. 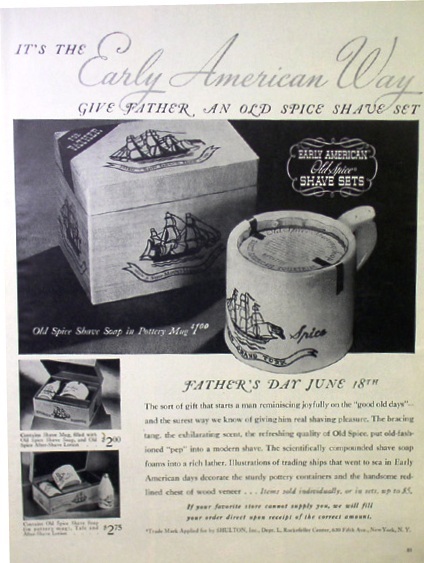 Through most of the early days, magazines were the media of choice for reaching customers, and Shulton soon learned to target Christmas, and Father's Day with special coverage. I have assembled a gallery of over 250 magazine ads and other advertising-related items on the pages linked to in the navigation menu at left.